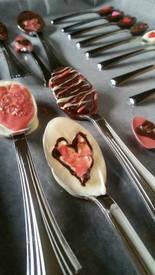 Diy valentines day coffee spoons! My favorite thing about Valentine’s Day is all the chocolate. It comes in all forms and it doesn’t even matter if I’m single or not. It simply makes everything wonderful. Combining chocolate with my other favorite vice–coffee–is just a set up for greatness. Chocolate dipped spoons are the ultimate way to stir your coffee into a heavenly concoction.